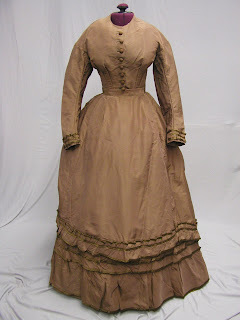 550, 1860's 3 pc. Daytime Civil War Era Dress Tobacco Brown: This tobacco brown faille dress was created in the last half of the 1860's decade. 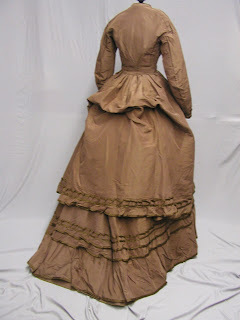 It has the huge skirt with the huge bustle in the back. It is three pieces but someone has tacked the bodice and the over skirt together at the back. The over skirt has all of its original under ties. 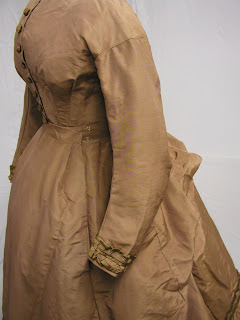 The bodice and over skirt are both in good condition. The bodice does have underarm stains. These aren't noticeable when on. 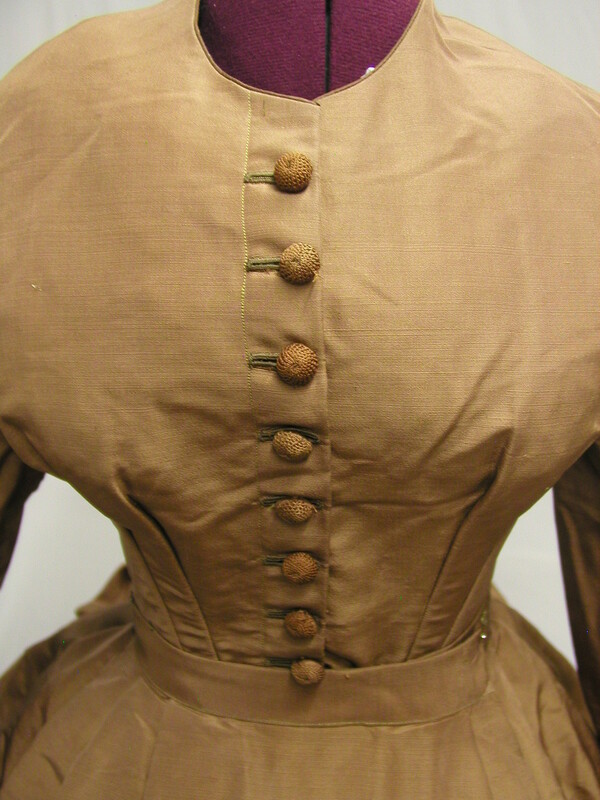 The bust is 32, and the waist is 22. 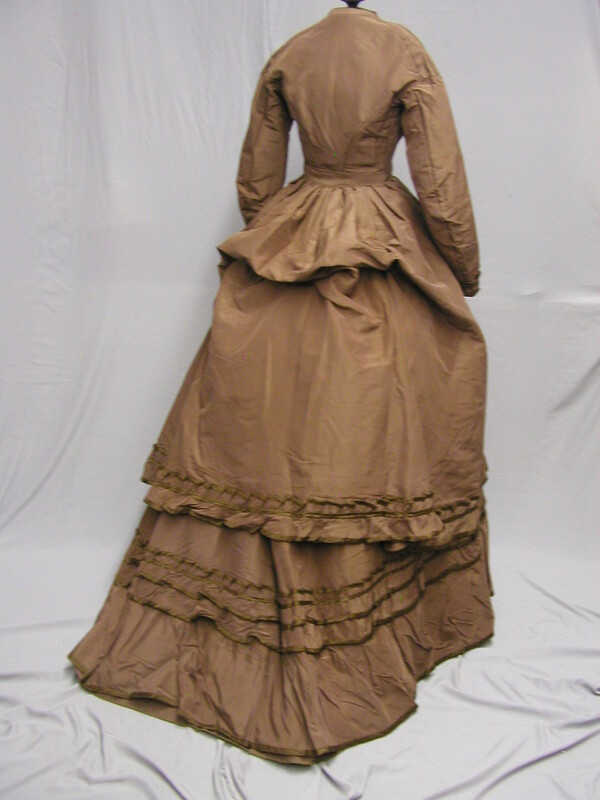 The over skirt has a waist of 22 and a front length of 30.5. 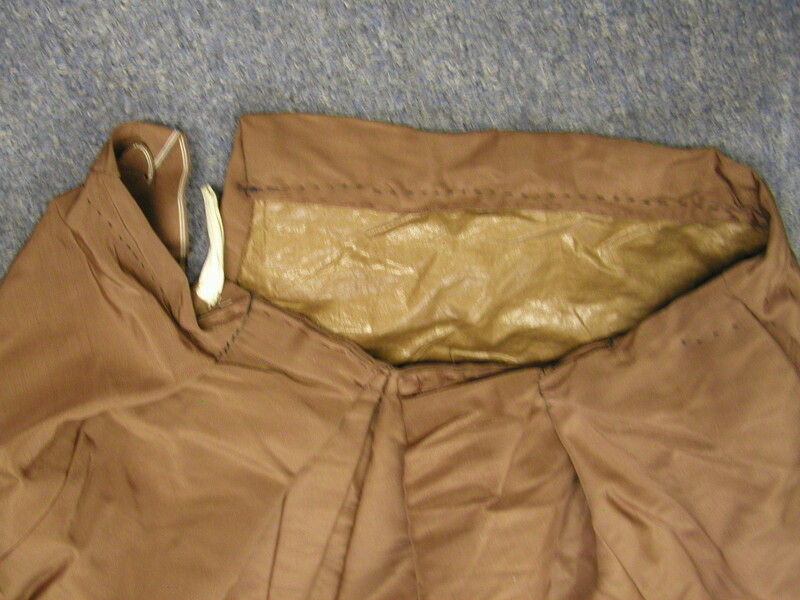 The under skirt has a waist of 28, a skirt length of 42 and is 134 inches around the bottom. The waist band of the under skirt has been reworked and it wasn't a good job. It is now 28 inches and it should be around 23. They have taken out the pleating and not put it back correctly. See photo. For my pictures I pleated it in the front with pins so it would hang correctly. 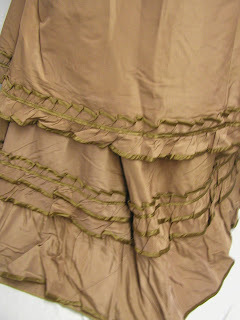 The fabric of this ensemble is in good condition. It is very sturdy. If you were tiny enoughyou could wear it once the under skirt is fixed properly. If you just want it for exhibition you can just pin it. This ensemble came from a major museum collection. The bidding will start at $0.99. Will quote reserve upon request. There are a few things that give this away as 1870's - although it does have some design elements of the 1860's. 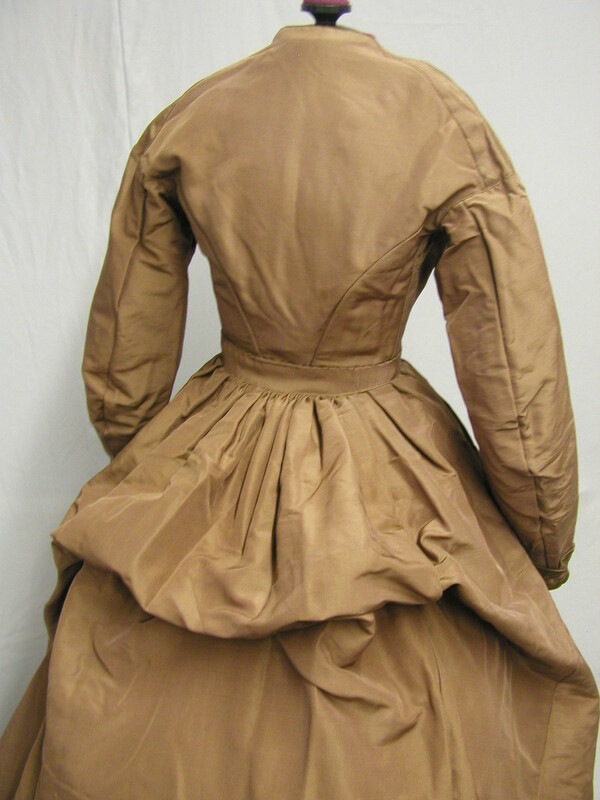 First, the bustled back - very 1870's. The shape of the skirt - it's narrow at the sides but goes back. 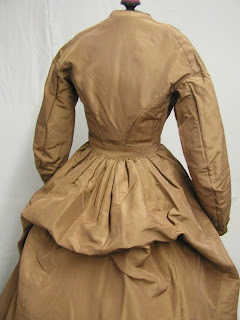 The trim placement on the skirt, also rather late 1860's/early 1870's. 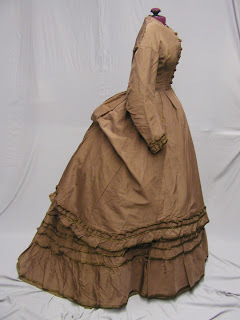 This probably was remade from an earlier dress, hence the very 1860's look bodice but the skirt style is all 1870's. I really like this dress. Simple, but elegant. My thoughts too. :-) I can easily see someone wearing this at home while doing the weekly sewing.